Preliminary notice: If you're bugged out or otherwise offended by the sheer mention of Superman in association with Christianity, Christ, or if hearing about anything religious makes your monkeys attack, please, do me a favor and go read an episode synopsis for "Smallville" or a story about Superman's costume in the new movie, because this article covers areas of both religion AND atheism, God, Jesus, and all kinds of happy stuff. You've been warned! Now, sad as it is that I have to make that disclaimer, now we can walk into the subject matter. Skelton's book is a critical examination of Superman as both an allegorical representation of Christ and a literal one, positing that through the theory of the intentional fallacy, one who is Christian is motivated or even obligated to understand Christ in greater depth through literature, and that in our society, one of the best representations is Superman. The book covers this in deep, provoking discussion through examination of the films, the comics, the radio serials, through interviews. If you're looking for a thorough, and I do mean thorough examination of Superman as a Christ figure, you can't find a better, more in-depth examination. I concede a degree of jealousy, given that I attempted to do the same thing a few years ago for Christmas, when a gentleman wrote me explaining why he thought Superman was a Jewish conspiracy to inundate us with the anti-Christ. My response article can be found on this site. That article was difficult to write, mostly because it involves something that's very difficult to understand, very difficult to quantify. Faith. I endeavored to do so because I believe ultimately a dialogue is absolutely essential for a proper and full understanding of the character we all debate and love here. If you take my minor meandering, and add a very extensive set of research, you end up with this book, which is entertaining, well written, thorough and in-depth, a strong piece. I would recommend it for ANYONE who loves Superman. Or anyone, religious or atheist. I myself, as some of you may know, am an atheist. I study Christianity extensively, and have myself written a book on the subject of religion, which laces and empowers pretty much every work I right. I'm fascinated by works involving Christ, and one of my favorite books is the Bible, which I've read through twice, more like three times looking back and forth. At any rate, Christian or not, I am versed. So I feel qualified to say, and do, often, whether someone who writes a religious article is full of beans and doesn't know his subject. Skelton quite obviously proves that he knows his subject, can write persuasively about it, and also in a way which resonates even with people who do not adopt his perspective on religion, such as me. Are there problems? Yes. In fact, with me, most religious narratives run into the same problem with me that they always do, as the whole premise of religion is faith. Faith is, necessarily, believing in something without the evidence to do so. This is a whole book that is based on believing in Christ on faith, and Superman as an extension to that. So the guttural feeling I get as an atheist is, "Okay, why is this important to me?" But this problem is quickly allayed, reading it, in that you realize how others view the character. You gain perspective in learning an alternative point of view, especially in finding its validity and practical application, for the sake of argument, and the sake of perspective. And since, statistically speaking, most of you are those others, people who see Christ as a messianic figure and are religious, this book is a critical examination I would purport that you MUST read, if not as an affirmation of it, than as a test of the things you hold dear as compared to this work. Furthermore, if it resonates with ME, an a-religious person, I can only imagine what it might mean to those of you who are Christian, and how well it would sit with you. Another problem I have, and have always had from my first days in rudimentary philosophy, is the intentional fallacy. I used to get in very bitter fights in class, where I was typically the patient one, where I would argue that it doesn't matter how a piece is interpreted, the true intent of the piece must be divined from the author and the author alone, and all else is speculation. The intentional fallacy states that since author intention is impossible to divine, it therefore is only plausible to divine meaning from how people react to it. I wholly and strenuously disagree, if not because it's counter-intuitive, but because there are many people who have no audience who have plenty of meaning, purpose, and epic torque to their worlds that by the intentional fallacy are deigned not of any message at all, or worthless. Because, by the intentional fallacy, if no one reads your work, it is obviously not of note. Also, even if a ton of people read the work, the intentional fallacy fails. It may seem patently obvious that Mein Kampf is a story written by Hitler to guide his rise to power, and that's how even most contemporary English teachers view and guide the work, and honestly, in casual conversation, how most people view it today. But the truth is that Hitler wrote it while a piddling undersecretary for a minor but growing anti-Semitic group. He might have had aspirations, but no idea that it would become what it was. Similarly with the Communist Manifesto, perhaps. It is a purer work under Marx, in that he didn't write it with bread lines in mind. The intentional fallacy brands the communist manifesto as a horror of works. It is actually quite the plausible argument, like this book, even if you wholly disagree with it. Of course, I like this book as opposed to the communist manifesto (dry!) and am hardly comparing the two, but I'm just saying, if I didn't judge this book on the author's intentions, I could read all kinds of things into it that aren't there, and get away with it as logical. Which is dumb. The reader is not all powerful. The writer is. That's the whole idea behind creating. Otherwise, heck, for that matter, why would God have any power at all? The intentional fallacy's failure is that it assumes you cannot ask what a writer's intentions were and thus divine what the point of a work is. But last I checked, you can write them, interview them, etcetera. If they are dead, there is no obvious way, and if they turn down your interview, okay, feel free to make assumptions, but if an author can answer for their work and choose to, there's no reason the intentional fallacy holds any merit. Which is, to wit, why I'm emailing an interview to Stephen Skelton shortly. I think he can cast light on my doubts and aspersions and bring an even MORE great experience to my read of his book and your introduction do it. I guess the point being, this book uses the intentional fallacy to promote an argument that can really be simplified through Occam's Razor: because Christ is a figure that inspires and is given through divinity to be emulated, it doesn't matter WHAT Siegel and Schuster wanted with the character, because he Christianly resonates, he is therefore a Christian figure. I don't see the need for this connection, myself. I see that Superman, as a Christian reading him, is simply an inspiration to be like Christ. This doesn't need to be proven through the intentional fallacy. It is simply true. Or even, as an atheist who admires the example of Christ, I believe that Superman resonates with me in a secular way because he examines things in a very Christian way without entailing the need to believe in an invisible omniscient, omnipotent, omnibenevolent being that exists necessarily and is the creator of all contingent things. Also, because morality is a very common thing across religions, saying that he embodies Christian values doesn't even exclude the atheist beyond the existence of God, because a Christian in a very common sense way adopts most of the community values an atheist would through their religion. Morality is a commonality of utilitarian belief, and Superman, as the embodiment of that, means this to both Christians and atheists. He has particular relevance to the Christian, but he isn't, nor will he ever be, wholly Christian. That doesn't mean that without the intentional fallacy he cannot be interpreted in a wholly Christian way. He can. Even by the atheist. Enjoyably. And even as a secular hero. Enjoyably. That's why his character endures. The book seeks to address people who would criticize the book, saying that the secular would describe Superman as an inspiration for everyone, and not specifically for Christians. And that's true. But it's also true that he's an inspiration solely for Christians in a very non-secular way, so it's an argument that doesn't need to be there. This book doesn't need to be an apologist, because if you want Christians to prove themselves before you listen to them, you're as close-minded as a Christian who won't talk to you because you're an atheist, and are NOT reading a book antithetical to your beliefs anyway, which is sad. Because this is an AWESOME book that doesn't need a justification. But this defense, and thus the whole passage on the intentional fallacy, comes about because of the same critical eye people cast on anyone who even TALKS about religion, thus my caveat at the beginning of the article I wish I didn't have to put, and thus a VERY solid writer's kinship on my part with the author. And a diviner respect, if you'll forgive me being smart. But I dwell too much tangentially. The above paragraphs aren't an indictment of the work, I stress, AT ALL, merely a compliment to the author for being so thorough as to justify his ideas as a Christian concept to a non-Christian or a Christian critic when really, even for the atheist reader, his concepts are truly fascinating, innovative, and a blast. There are angles that I've missed over the years. The death and resurrection in depth, an example Lucifer as represented through Luthor. Luthor selling his soul and bringing about Nietzsche's Superman in Luthor and Christ's Superman in Clark. Symbolism in the Superman movie that is subconscious, but nonetheless very strong. You really should read this book if you have ANY love of comparisons between Superman and Christ, as I do, and I'm glad Stephen Skelton gave me the chance to look at his book early. It's quite the privilege. You learn that Superman's earthly parents had original names of Mary and Joseph, Ma's first name and Pa's middle name. You also find a number of distinctions as to how Superman is very much like Christ as opposed to other dying-and-rising gods, gods of the mystery religion, or Buddha and Krishna. My favorite moment of the book is the realization, slowly but surely, that Christic symbolism in Superman is not a BAD thing, because in fact it is already all-pervasive, and part of what I love about the character. Before this book, I was critical first, and now I'm seeing it more in context. I've been critical of late of Christianity inserted into Superman. I even indicted Azzarello because he put Superman in a church, which takes away from how Superman is everything to everyone, and I continue to do so, but I don't mind Superman adopting a Christian resolve or making a Christian homage. If I didn't have the Christian resonations as described in this book, I wouldn't have half of the epic moment of the character. Maybe I'm not saying that it's okay to insert Christ into Superman, but I am saying that if an author does in order to create a good story, as I know many have, I won't complain. And as so many have, and have well, I now know, it's a critical part of the Superman story and history. A fine work. I recommend it. 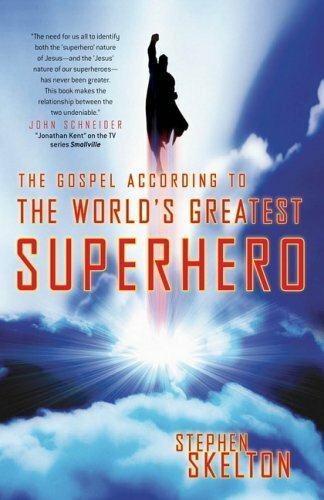 Note: Click here to order "The Gospel According to the World's Greatest Superhero" by Stephen Skelton.